Peachicks deformed feet need to be corrected soon after hatching, it is easy to straighten peachicks feet. Some peachicks are born with toes that are curled up and do not straighten naturally within the first day after hatching. These bent toes can easily be corrected with a simple procedure involving Sellotape. However it is important to correct the toes early after hatching to maximise the chance of the peachick getting straight toes. What do you need to straighten peachicks feet? 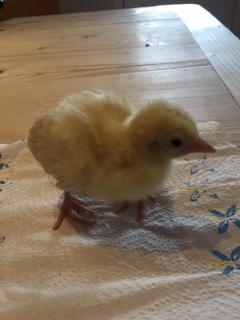 Get someone else to hold the peachick or wrap its body in a piece of folded kitchen towel to enclose its wings, so that it cannot flap around. Next spread a piece of kitchen towel out on a flat dry well-lit surface. Cut a piece of tape approximately one inch or two centimetres long. Straighten the peachicks toes individually and wrap the tape around the peachicks bent toes, one at a time. Remove the tape gently after two days, the toes should be perfectly straight. If the toes are not straight, repeat the process for another two days with fresh tape. This is how to correct peachicks deformed feet, quickly and easily.